The mean Sea Urchins have stolen all the Gold Bars in the undersea kingdom of Clu Clu Land and buried them. Bubbles sets out to uncover all the gold. Bubbles can only travel in a straight line until she hits a wall. In order to change direction, she has to stick out her arm and grab Turn Posts to spin around. Passing between Turn Posts reveals the Gold Bars. When all of the Gold Bars have been uncovered a picture is revealed and the stage is cleared. Bubbles can also blast the Urchins with a shockwave and push them into walls for bonus points. The hero. She is a red, ball-shaped creature with two long arms that she uses to grip Turn Posts in order to change direction. She will bounce off walls like a ball, but burst if she touches the Sea Urchin's spikes. She can attack the Sea Urchins by shooting shock waves from her mouth. In the 2 Player Game, the second player controls a green Bubbles. If the two Bubbles hit each other, they bounce away in opposite directions. The mean Sea Urchins that stole the treasure and hid it in the mazes of Clu Clu Land. They appear from Black Holes and wander around the maze, getting in Bubbles' way. If Bubbles bumps into a Sea Urchin she will burst and lose a life. Shoot a Sea Urchin with a shock wave and it will shrivel up for a short time. While it is shrivelled, Bubbles can push it into the walls of the maze to defeat it. A swirling vortex where the Sea Urchins live. If Bubbles crosses a Black Hole, she will be sucked inside and lose a life. Bubbles can pass over the top of a Black Hole if she is holding a Turn Post. A pink rubber trap set by the Sea Urchins that will suddenly appear when passing between two Turn Posts. If Bubbles hits the Rubber Trap she will immediately turn around. Posts found in each level. Bubbles hooks her hand around them in order to turn and change direction. The treasure, stolen by the Sea Urchins and hidden in the mazes of Clu Clu Land. When Bubbles passes over where a Gold Bar has been hidden, it will appear. When all of the Gold Bars have been uncovered the stage is cleared. Delicious fruit that appears randomly on the stage for a short time. Worth 800 points. A mystery bag that appears randomly on the stage for a short time. Worth 1,500 points. A white flag that appears randomly on the stage for a short time. Rewards you with an extra life. A clock that appears randomly on the stage for a short time. 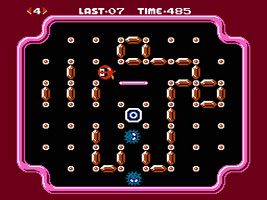 When collected, the screen brightens and the Sea Urchin, time counter, and opposing player (in the 2 Player mode) will freeze for a few seconds. Makes Bubbles stick out her arm in the chosen direction. If she hits a turning post she will grab it with that hand and spin around for as long as you hold down that direction on the Control Pad. Send out electric shock waves to stun the Sea Urchins. Bubbles can only have two shock waves on-screen at any one time. Pause: If you wish to interrupt play in the middle of a game, press the START button. The pause tone will sound and the game will stop. Press the START button again when you wish to continue playing. The game will continue from where you left off. If Bubbles passes between two Turn Posts where a Gold Bar is hidden, it will appear on screen. Find all of the Gold Bars within the time limit. When all of the Gold Bars are uncovered, a picture is revealed and the stage is cleared. Sea Urchins will appear from Black Holes and will move around the maze. They are unable to move through uncovered Gold Bars. Hit the Sea Urchins with shock waves to stun them temporarily, and after a while they will recover. To defeat the Sea Urchin for good, stun it and push it into the walls of the maze. There are 5 mazes in Clu Clu Land: Pink, Green, Blue, Purple and Yellow. After clearing the Yellow stage you go to a Bonus Round, where the aim is to uncover as many Gold Bars as you can before the timer runs out. After the Bonus Stage you will repeat the mazes from Green with certain conditions changed (for example: higher speed, more enemies, pass over Gold Bars twice to uncover them). Bubbles loses a life if she hits a Sea Urchin, falls into a Black Hole or if the timer runs to 0. After clearing 21 scenes you have beaten Clu Clu Land. The game will go back to the beginning with scene 22, where moving over an uncovered Gold Bar will cover it up again. After clearing a stage or losing your last life, your points are tallied on the score display screen. Note that Bonus Fruit, Bonus Sacks and other points are added during game play. Note that it actually seems near-impossible to uncover all the Gold Bars in the Bonus Round within the short time limit. The following charts show the possible solutions for each of the stage types.